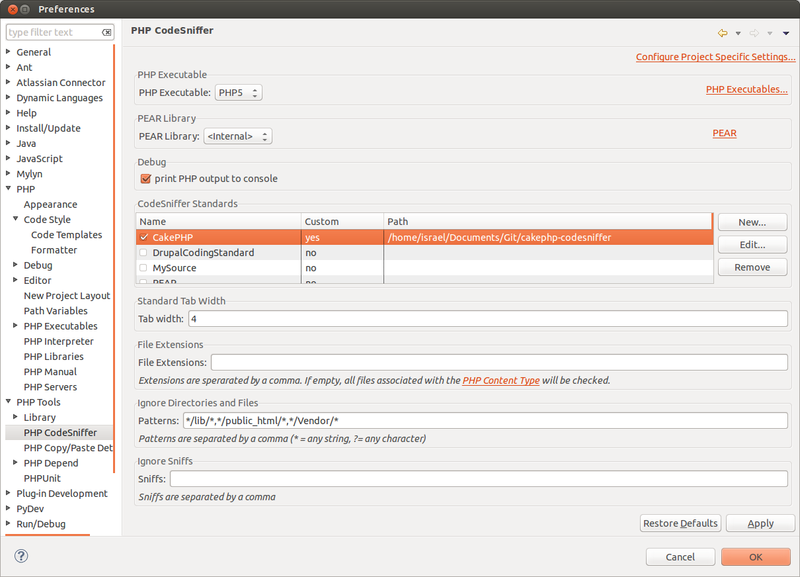 How to setup PHP CodeSniffer + Formartter profile for CakePHP in Eclipse? I installed the Eclipse plugin as well as download and install the CakePHP CodeSniffer code on my Eclipse as you can see on the image below. In the other hand I want to be able to format my code following the CakePHP Conventions where can I found a fomatter profile that match with the CakePHP code conventions. I had several problem trying to install CodeSniffer and make it run with Eclipse properly. That was the steps I followed to made it run properly, you will find on this post detailed instructions about how to configure, How to Eclipse + CodeSniffer + CakePHP Sniff. Not the answer you're looking for? Browse other questions tagged eclipse cakephp configuration conventions sniffer or ask your own question.